Andrew Whitehead from Devotion presents five reasons why digital agencies should use a headless CMS like Kentico Cloud, and provides real-world examples of the Kentico Cloud projects they have completed and are currently working on. Andrew Whitehead, Creative and Managing Director at Devotion, gave a remarkable presentation at the Kentico Roadshow in Sydney, where he pointed out five reasons to go headless from an agency perspective. 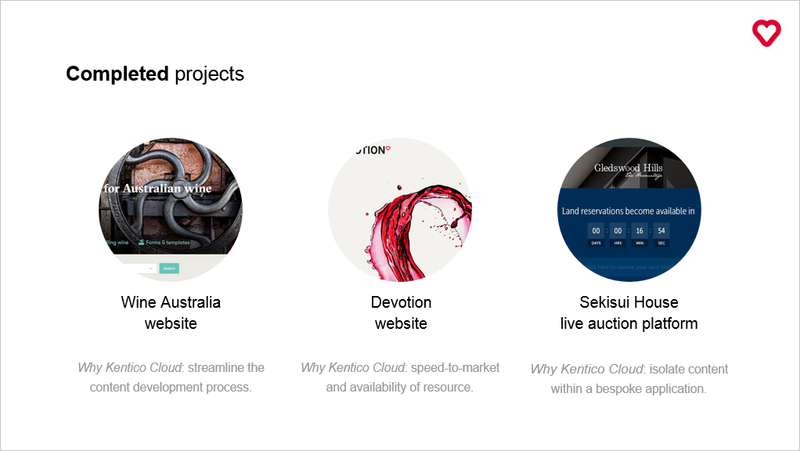 Devotion has already used Kentico Cloud headless CMS for three projects, Wine Australia, the Devotion website, and a live auction platform for Sekisui House. And they are currently in development for three others—two websites and a mobile application. For agencies that still wonder what in headless CMS is for them, Andrew has a simple answer: Headless CMS opens up additional revenue streams, allows seamless management of multichannel content, enables rapid delivery of solutions, and much more. So what are his FIVE reasons to go headless? You can use any programming language. Developers love using the latest technology and they’ll have the freedom to work with React, Angular JS, MVC Core, or any other technology of their choice. You can also get developers up and running quicker, as there is little onboarding. The Devotion website is a great example of such flexibility. 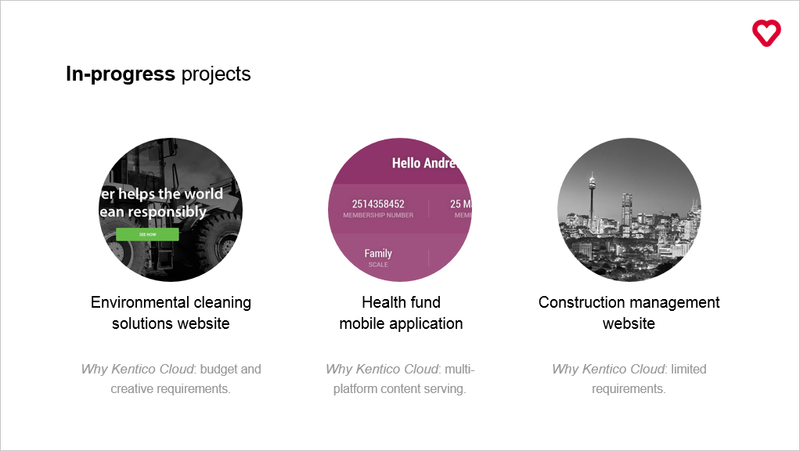 With Kentico Cloud, it took just 2 weeks to deliver the project. While content editors were fine-tuning the content, front-end developers built the site with Vue.js, and the whole team could be working simultaneously. With headless CMS, you can make content accessible to any channel or device via the API, including web, mobile, kiosks, and wearables. As you deliver content components or blocks, not pages, you can innovate, try new things, and provide great digital experiences. The Devotion team is currently working on a big Health Fund application that is being built in React Native and will be output to iOS and Android. While the data is provided by the ERP API, the content is provided by Kentico Cloud. By separating the content from its presentation, you can take more control of your project. Moreover, you no longer need to worry about availability, security, performance, or upgrades, because headless CMS vendors (like Kentico) take care of these things, so you can focus on your website or application. Sekisui House, Japan’s largest builder, who Devotion built a live auction platform for, was very particular about separating the content from the MVC Core back end, so that their project could be delivered within the tight deadline of 7 days. This way, the team could create content in tandem with development. Headless CMS allows agency teams to work simultaneously, create their own workflows and processes, and finish projects much quicker. Besides, Kentico Cloud has a super-fast API which delivers your content to any device in almost no time. Using Kentico Cloud to prepare content for the Wine Australia website helped the Devotion team save 3 months on content creation. As you can see in the case study, the team had 30 editors writing, reviewing, and approving the huge amount of content consisting of more than 1,700 content items. In Andrew’s words, content is the most precious commodity that you’re putting in front of someone. Kentico Cloud allows you to think content first. Using headless CMS, multiple front ends can peacefully coexist and you can get into some fun stuff like virtual reality, digital assistants, IoT, or anything else your creativity allows. Devotion is currently working on a website for Environmental Cleaning Solutions who wanted a brochureware with a complex front-end design. Even though this project has a relatively low budget, Kentico Cloud enabled designers to push the boundaries and create an engaging online experience. If you want to know more about the five real-world reasons to go headless, watch a recording of Andrew’s presentation below, or see the slides on SlideShare.